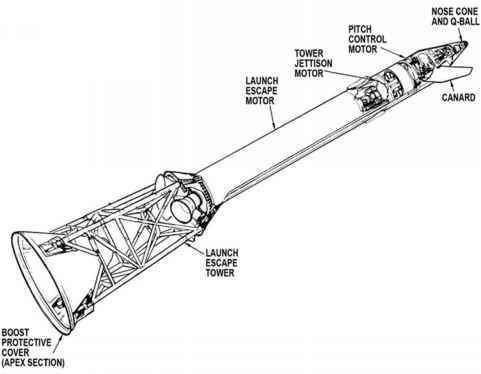 At T-20 seconds, swing arm 2 was retracted from its position connected to the top of the S-IC. As it arced back to the tower, the guidance system on the Saturn was finally set for the flight. In the instrument unit above the S-IVB stage, there was a conventional gimbal-mounted guidance platform - the type that can hold its orientation while the vehicle around it rotates. As the Earth turned with the Saturn V on the pad, the platform kept its alignment with respect to the stars. If an onlooker could have watched it over a few hours, it would have appeared to rotate, making one full turn each day. Both CM and LM contained a similar device, which will be discussed more fully later in the book. The Saturn's guidance platform provided two important pieces of information needed to guide the space vehicle to the required orbit. One was knowledge of the direction in which the rocket was pointed. This was derived from the platform's property as a reference against which the vehicle's orientation (normally referred to as its attitude) could be measured. The second came from a set of accelerometers mounted on the platform with which the instrument unit's computer could sense the movement of the rocket, and hence, its three-dimensional path from the Earth and through space. The positioning of the Saturn on the pad, and indeed of the pad itself, was not haphazard. It had been carefully thought out prior to being built. Each pad was aligned to the cardinal points of direction, with the flame trench running exactly north-south. The launch vehicle was brought to it with its umbilical tower to the north. From here, the most efficient heading was to fly directly to the east, so the rocket was presented with the spacecraft's hatch also facing east. This way, when the rocket ascended and entered orbit, it did so with the spacecraft windows facing Earth and its navigation optics facing out into space. Most Apollos did not fly directly east but on a heading a little north or south of east to ensure that they reached the spot over the Pacific Ocean where the burn for the Moon would be made. The heading taken by the launch vehicle was known as its flight azimuth, where a heading due east was said to have an azimuth of 90 degrees. For the flight, the orientation of the platform had to be aligned to match the flight azimuth, but this could only be done a few seconds prior to lift-off. Had the platform been aligned too early and left uncorrected, Earth's rotation would have rendered the alignment invalid by the time lift-off occurred. What was done on the Saturn V was to align its orientation with respect to a theodolite that was mounted some way from the pad between the crawlerway tracks. A small window in the side of the instrument unit was provided for this purpose. The platform's alignment was then held rigid until T-17 seconds, the time of guidance reference release when it was set free. This allowed it to hold its orientation with respect to the stars. This moment has been immortalised in the recordings from that era when the NASA public affairs officer announced to the world, ''Guidance is internal''. If the countdown had to be stopped after T-17 seconds, a new flight azimuth had to be calculated and the platform realigned to it.